The merchandising for The Path has been a really home-made affair, despite the fact that we get our stuff professionally printed. We still load up the data on the USB drive ourselves, I pack up each poster and try to give everything a personal touch. We actually don’t make much money from selling these USBs and posters and cards but I am very happy that people who like having a physical product can have one to remember our game by. 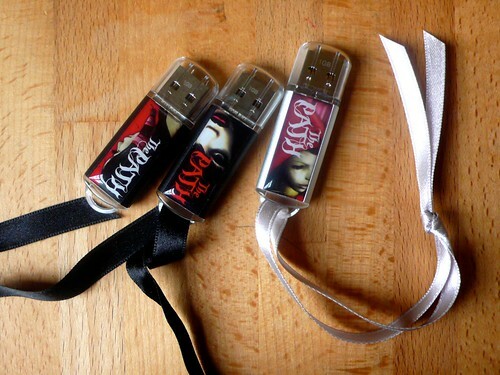 The choice to make USB sticks rather than CD’s was a simple one. We wanted fans to have something they could keep using long after they’ve stopped playing. I imagine that you could copy all the data then put whatever you want on the drive for many years to come. I have hundreds of old CD’s sitting in boxes in the attic… we didn’t want The Path to be one of those things. And so far we’ve done 3 editions of the Ruby one, 2 of Rose and this will be the one and only time we’ll print Robin, to keep her edition special. For The Path’s 1 year anniversary, we are selling the silver USB featuring a sweet little print of Robin that contains the PC & Mac version of the game plus your choice of poster. The Rose (Mac only USB) is marked down until March 28. There are lots of other things on sale too. This entry is filed under Anniversary, Promotion. You can follow any responses to this entry through RSS 2.0. Both comments and pings are currently closed. .